Does my home's foundation need to be repaired? Does Your Home Need its Foundation Repaired? Having inspected almost 5000 homes in my career, I have seen every degree of settling and foundation issue. I have also discovered that there is a difference between typical settling and foundation problems that require extensive repairs. Most of the homes that I have inspected have foundations that fall into the category of those that have experienced some typical settling while a small percentage have needed extensive foundation repairs. Most soils in this area of Texas area contain some expansive clay. Expansive clay gets its name from the fact that it expands significantly when it gets wet. Expansive clay soils can exert extremely high pressures on a home’s foundation and can cause serious damage if left alone. For homes built on expansive clay soils, changes in moisture level in the soil is the foundation’s worst enemy. During dry periods, the soil will contract and pull away from the foundation, leaving the edges of the foundation essentially unsupported. Since concrete slabs are flexible and not perfectly rigid, the foundation will actually sag along the edges. Then when it rains, the soil expands and pushes up against the foundation with extremely high forces. This down and up movement along the edge of the foundation is what causes cracks in ceilings, walls, brick veneer, and worse yet, in the foundation, itself. Do cracks over doors and windows and in the exterior brick mean that you have foundation problems? Possibly, but not necessarily. It does mean that your foundation is moving or flexing, just as all concrete slabs do. It’s the amount of flexing that should concern you. What can you do to minimize this flexing and to protect your foundation? First and foremost, maintain a constant moisture level in the soil around your home. This is impossible to do completely, but here are some steps that you can take. 1. Ensure the grading around your home is correct. The soil around your home should slope down about six inches in the first ten feet out from your home. This will allow rain water to be carried away from your foundation. 2. Use rain gutters and downspout extensions to divert as much water as possible off of your roof and away from the foundation. 3. Implement a watering plan to help keep the soil near your foundation constantly moist. This will minimize the large expansion/contraction cycles that the soil would otherwise go through. Sometimes it may be necessary to have your foundation repaired by a foundation repair company - an expensive undertaking. 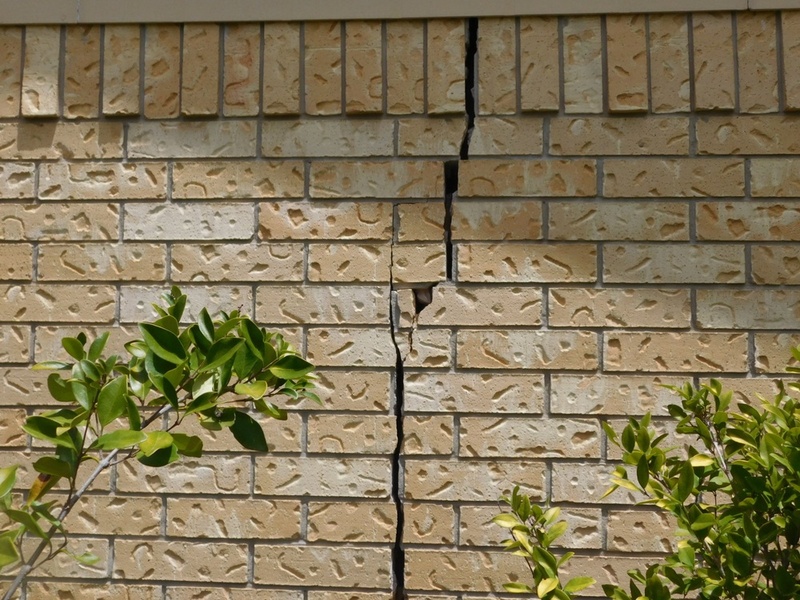 If your home requires this, be aware that it is very likely that cracks will re-appear after only a few years unless you also implement a strategy to control the moisture level in the soil around your home. Depending on the amount of damage already done, it is possible that this expense can be put off or even eliminated simply by controlling the moisture level in the soil. What's the Big Deal about S-traps? Is an Over-sized Air Conditioner a Good Idea?